It had been a while since the last time I saw the Australian Pink Floyd Show on stage, but I had good memories about the gigs I attended. So when DPRP editor Bart asked me if I wanted to join him and Derk for a show the band played in Oberhausen it didn't take long for me to make a decision. A nice detail was that Bart was invited as a friend of the band and we got free entry tickets and backstage passes. So, what makes the Aussie Floyd so special ? Well, a couple of things. First reason: they play material from the whole of Floyd's catalogue, right from the sixties' Piper at the Gates of Dawn up to material from The Division Bell. Unfortunately for the die-hard Floyd fan looking for some variation (like me),they still tend to focus on the big favourites of 'the crowd'. Second reason: they are the most technically able Floyd tribute band's I've ever seen. Now, Pink Floyd's music might seem very difficult and complex, but most of it is actually remarkably simple to play, and the Aussies do that very well. Not perfect, there's still room for improvement (like the choice of keyboard sounds and some of the vocals), but still very well. Third reason: the incredibly huge and impressive show they drag along. It's really like seeing a scaled down version of a 'real' Floyd Show. All of these added together make the Aussie Floyd the best Pink Floyd tribute band I know. And I'm probably not the only one with this opinion. I mean, a tribute band doesn't normally get to fill the Royal Albert Hall or play at the original guitarist's birthday party. Indeed, all of these three reasons more than make up for the lack of improvisation in the band's renditions of classic Floyd material. Oberhausen's Arena turned out to be an interesting venue. Easy to reach, lots of free parking space and simple, non-crowded entries. The hall itself is exactly like it's name; an Arena. The full thing would probably fit about 6000 people, but by moving the stage forwards a smaller arena could be created. This was also the case for The Australian Pink Floyd show. There were probably 1500 to 2000 people present for the show, not at all bad for a tribute band. We had received tickets for seats in the in the arena itself, about 7 rows from the stage. Very good seats actually, if you would forget about the pumping bass speakers right in front of you which I could feel in my stomach and chest for most of the gig, especially when the volume was increased during the second half. Exactly according to schedule the sound effects started playing at 20:00 hours, after which the band came on for a full rendition of Dark Side of the Moon. The band's line-up had expanded considerably since the last time I saw them. They now featured two guitarists, a bass player, a drummer, a keyboard player, a saxophone player and two female backing singers, one of which performed an immaculate version of The Great Gig in the Sky. 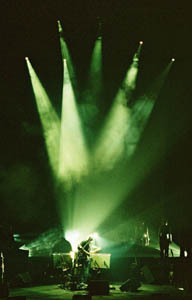 After a short intermission and an intro tape which was a compilations of sound effects from the Floyd's full career, the band returned for another set of classic Floyd material. In the last 20 years I've seen so many performances by Pink Floyd tribute bands that a certain fatigue sinks in. When you're going to a tribute gig you can guess what songs's you're probably going to get, and most of them are in the band's setlist. Taking into account that it's not the real thing you're watching there's only so many cover versions of Shine On and Comfortably Numb one can take. So, I've come to find that most tribute band shows offer very few surprises, music-wise. This also goes for most of the setlist of the Aussie Floyd's Dark Side of the Moon tour. There were however a few surprises in the setlist, among which The Fletcher Memorial Home from The Final Cut and an absolutely enchanting rendition of Careful With That Axe Eugene, the latter being one of my favourite moments of the show. But not everything went flawlessly. It seemed to me that Run Like Hell was played at a slower pace than I'm used to, resulting in a less powerful, less driving version that missed impact for me. Also, during the extension of Another Brick in the Wall where additional solos are played I noticed a rather bare sound compared to other live versions I know. I then noticed that one of the guitarists was not playing the rhythm guitar parts, resulting in the mentioned bare sound. A very smart element of the lightshow was the big backdrop screen. 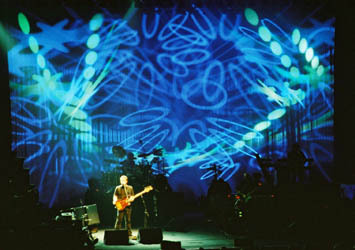 Besides the round screen with varilights attached to them - basically a smaller version of the Floyd's own Mr. Screen - there was a second big backdrop screen behind it, as wide as the full stage. During the show different projections would be shown on the inner and outer screen. Whereas the inner screen mostly showed the animations and film footage, the backdrop screen would often show beautiful coloured patterns and textures. The combination of these created a marvellously beautiful and sometimes even mesmerizing effect. At times the round screen would not be used, resulting in projections spread across the full width of the stage. This worked especially well with a sea of flames which suddenly errupted during the 'scream section' of Eugene. Another fine moment was when the scrolling symbols were projected during Keep Talking. And then the projections, another splendid element of the show. 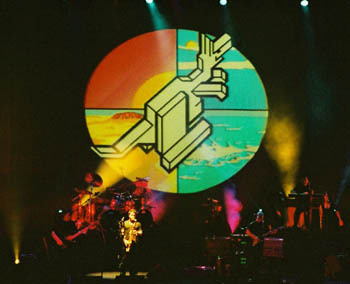 The band tries to recreate the same atmosphere as Pink Floyd with their characteristical film and animation footage. But the Aussie Floyd's add their own personal touch and sense of humour to it. So, instead of the filmed footage of the man in the flying bed in On The Run we're treated to computer animation of a sunglassed kangeroo in a flying bed. Also, Pink Floyd's footage of politicians for Brain Damage were replaced with other 'lunatics' of the past 20 years like Thatcher, Bush, Blair, Saddam Houssein , etc. Several other songs also featured film and animation, most of the time created from scratch but still using all of the familiar Floyd symbolism and images like the diver and desert of Wish You Were Here, the album cover of Pulse, the bricks and hammers and many more. A very creepy new version of the teacher and a harmless Pink for Another Brick In The Wall deserve special mentioning. Most of these animations were very impressive, although there was the well-known limitation of creating computer animations of living beings and their movements which made some of the stuff look a bit cheesy. Also, not all of the projections were exactly sharp and in focus, which was a flaw which could have been avoided. But there was more. The whole stage was filled with lots of moveable varilights which were used to create wonderful light patters and beams. And last but not least there was the big mirrorball (probably 1,5 meter large) which was lowered from the ceiling during Comfortably Numb to bath the stage and screens in a see of lightspots. All in all a very enjoyable and impressive evening with over 2 hours of (mostly) fine Floyd renditions, both musically and visually. After the show we went backstage for a chat with bass player Colin and his wife Wendy, both very kind and sympathetic people, before returning to Holland and some well deserved sleep well past the midnight hour.